Writing, Surviving & Thriving: Walking in Purpose: Ameena Matthews ROCKS! Walking in Purpose: Ameena Matthews ROCKS! I had the pleasure of watching Black Girls Rock after a busy day on Monday. I always enjoy the show, and I'm always impressed by how well put-together and entertaining it is. This year did not disappoint. While I enjoy the performances, I LOVE to watch the acceptance speeches. This year they honored a personal hero of mine, Marian Wright Edelman, and other amazing women such as Queen Latifah, Misty Copeland, and Venus Williams. However, my absolute favorite acceptance speech for the evening was from Ameena Matthews. I've watched her acceptance speech at least five times, and my wonderful husband found it online so I could watch it whenever the spirit moves me. 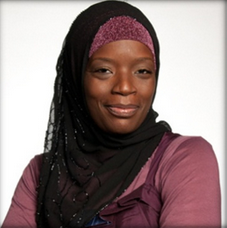 Ameena is a community activist who has dedicated herself to minimizing violence in Chicago. I was first made aware of Ameena's amazing dedication and commitment to her work via the documentary The Interrupters. Check it out if you haven't seen it. Then, I was completely smitten with this sister when I saw her on the Colbert Report. I told my husband that she's got "it," meaning, not only does she do commendable work, but she has a winning personality. She's charismatic. She draws people in. I love to witness people walking in their purpose, and purpose is all over Ameena. You can feel that she is convicted by her purpose. Her gratitude was palpable. I had a few big takeaways from her brief acceptance speech. 1. Be comfortable in your own skin and always know who you are. Ameena began by greeting the audience with "As-salamu alaykum" and acknowledging that she may not look like what is "mainstream." My favorite part of the speech, "Come on, Look at this gold tooth and this scarf!" Ameena was being raised up on a national stage for being just who she is. It's just enough, and it's just RIGHT! 2. Honor your elders. She knows that Marian Wright Edelman is EVERYTHING! 3. You have to see yourself where you want to go. She reminded her daughter that they used to watch the show and said that they would get there one day. They spoke that thing into existence! She is Sojurner! She is Harriet! She IS Ameena Matthews! 4. Know that your life's work divinely inspired. I know that Ameena's is. She acknowledged it, and you could feel it. I was watching like, "Is this Musliminah about to start shouting?!?!" Ha! Go in, Sister Ameena! Let the spirit move you! 5. Honor your spouse. Ameena acknowledged that she draws strength from her husband. She said he saw her purpose, and he's a part of it. 6. Make a difference in this world. Ameena reminded all of us to reach out and pour into the life of a young person. I just watched it again. I still have chills and goosebumps. Ameena, you absolutely rock! Keep doing God's work. Keep inspiring us all to do the same. Until next time . . . I'll be over here rockin' as well! yes! her speech gave so much life! and yes, you could definitely feel the spirit moving through her. i want to replay the speeches for the young girls i work with.